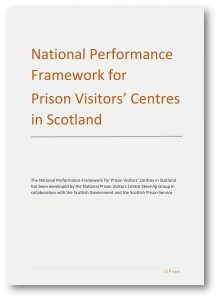 Andrew McLellan, Chair of the National Prison Visitor Centre Steering Group will unveil a new National Performance Framework for Prison Visitor Centres, which support families affected by imprisonment at the Working In Partnership, Raising the Standard conference in Edinburgh today. In 2015 the Scottish Government announced that it would be providing £1.8 million over three years to support the work of Prison Visitor Centres. Prison Visitor Centres seeking funding from the Scottish Government will now be required to demonstrate that they can meet the standards set out in the National Performance Framework. “Improving the support for prisoners’ families not only helps to reduce reoffending but it also improves the health and life chances of prisoners and their families.